I did 11 months of posting in the spine unit during the MS ORHTO residency at Sancheti hospital and developed a keen interest in spine surgery. I also worked in the Spine Unit at SIOR as a senior resident after the MS exams until Jan 2016. I then joined R.N. COOPER HOSPITAL in Mumbai where I managed trauma as well as spine cases independently. Later on, I joined Bombay Hospital in Mumbai as a Senior Registrar and Spine Associate with DR Vishal Kundnani until Jan 2017. I also worked as a clinical fellow at Seoul National University Hospital in South Korea in the Spine Surgery Department with Prof. Jin Sup Yeom. I had my Spine Surgery Fellowship at University Hospital of Copenhagen in Rigshospitalet, Denmark. Moreover, I worked at LMCH Nagpur as Assistant Professor along with managing a private spine clinic from May 2017 to February 2019. I also worked as a Consultant Spine Surgeon in Hyderabad, India at the Advanced Spine and Knee Care Hospital. MH PRE MED CET in 2004 with an 186 rank and passed MBBS from LTMMC, SION HOSPITAL, MUMBAI in 2009 (Aggregate 62% in final MBBS). 3 YEARS residency in orthopaedics at Sancheti Hospital, Pune. AO Spine Advanced Cervical Spine Cadaveric Course, Bangalore 2016. – Presented research papers in various conferences like POSAC 2013, MOACON 2013, IOACON 2014. Cervical Spondylotic Myelopathy – Anterior vs Posterior Approach (Writing Manuscript). In school: Was always in top 3 rankers in school from 1st to 10th std; merit certificate in Rashtrabhasha Prachar Samiti exams conducted all over India, open merit in 10th and 12th standards; played state level under 14/Under 16 football during school days. In medical college: Took an active part in various sports and cultural activities; was part of the college football team. Also took part in various quiz competitions and worked on a project in 2nd MBBS on socio-economic factors in weaning of breastfeeding children. 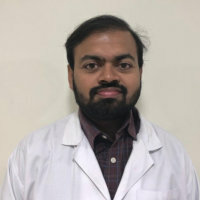 Dr. Parag Sancheti, Dean, Sancheti Hospital, Pune. Dr. Ketan Khurjekar, Chief Spine Surgeon, Sancheti Hospital, Pune.